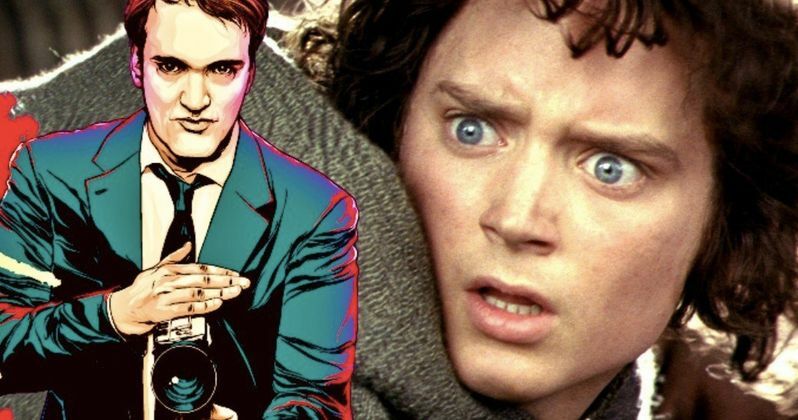 Quentin Tarantino directing Lord of the Rings? One can only imagine what that might look like, but in an alternate reality not too far from our own, this could have happened. According to a newly released book, Harvey Weinstein, who was involved in the production of Peter Jackson's Lord of the Rings trilogy, reportedly threatened to replace Jackson with the Pulp Fiction director over disagreements during the development phase. This reveal comes from a new book titled Anything You Can Imagine: Peter Jackson & The Making of Middle-Earth. The book comprehensively covers the making of both The Lord of the Rings and The Hobbit trilogies, with a ton of interviews and new tidbits. One such tidbit came from producer Ken Kamis, who worked on the project. According to his account, Harvey Weinstein had Quentin Tarantino ready to go. Here's what he had to say about it. "Harvey was like, 'you're either doing this or you're not. You're out. And I got Quentin ready to direct it.'" So why on Middle Earth would Harvey Weinstein want to see Quentin Tarantino put his bloody, stylistic stamp on the Lord of the Rings trilogy? At the time, Peter Jackson had produced a two-movie script (that ultimately became a three-movie script) and, as far as Weinstein was concerned, they had wasted $12 million on the idea. Reportedly, he and others at the Weinstein Company wanted to cut it down to one movie, making it a much more lean adaptation of J.R.R. Tolkien's beloved fantasy tale. During that time, Weinstein had a great working relationship with Tarantino, who had made all of his movies for the Weinstein Company up to that point. That has since changed, given Weinstein's massive scandal that broke last year. Some of those cuts would have been pretty extreme. According to an internal memo, some of those cuts would have included cutting the Helm's Deep valley scene, getting rid of the Balrog and potentially even getting rid of Christopher Lee's Saruman. Undoubtedly, many of these suggested cuts wound up being some of the more memorable elements of the entire franchise. Ian McKellen wouldn't have had the opportunity to say, "You shall not pass!" That is unthinkable at this point. A representative for Harvey Weinstein has denied the claim, but given what has come to light about the once powerful Hollywood figure in recent months, this is hardly the most difficult thing to believe. Even though it was a struggle between the studio and Peter Jackson, ultimately, things worked out for the best. The Lord of the Rings trilogy is one of the most successful franchises ever, grossing nearly $3 billion worldwide. The Hobbit movies, though not nearly as well-received, also made just shy of $3 billion and all told, the movies have won 17 Academy Awards, including a Best Picture Oscar for The Return of the King. But still, it's hard not to wonder how Tarantino would have worked Samuel L. Jackson saying "motherf****r" into the movie. This was previously reported by Short List. How Does Sean Astin Feel About The Lord of the Rings TV Show?